Those of you who get our newsletter already know that we have a new interview with Monica at Of Paper and Things. Monica has one of the best, most thoughtful art blogs around and has been a constant source of inspiration for us. She asks some great questions about our process, our influences and the future, so if you ever wanted to know more about us, be sure to check it out! Did we mention that there's also a giveaway? 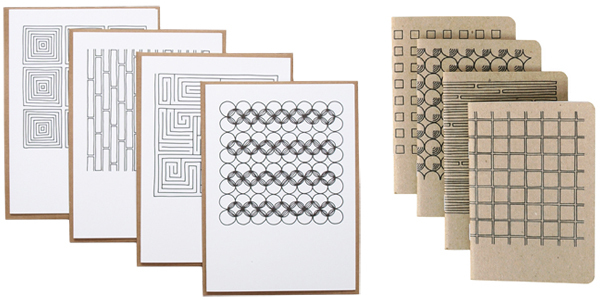 Just leave a comment at Of Paper and Things before Friday, June 17 for a chance to win a set of geometric notebooks and cards. I've been reading your blog for quite some time and I love the simplicity of your patterns and pieces. Oops, we failed to clarify that you should leave a comment on Of Paper and Things! Just fixed it!! PS. Thanks so much natt! !